This is going to be a bit of a bumper post due to the fact that I'm combining my favourites from November and December. Recently Woolworths had 50% off Covergirl, so I picked up their Ready Set Gorgeous Foundation and I've really loved it. It works well no matter how I apply it (either with my fingers, brushes or a sponge) and it's a fantastic option for anyone on a budget. I fell in love with The Super Sizer Mascara and I'm kicking myself for not picking up more. Next time I see Covergirl on sale I'll have to pick up a couple more for back ups. I'll probably pick up their Full Lash Bloom mascara too. While I'm not a fan of the Maybelline The Nudes Palette due to the fact that it has hardly any pigmentation, I ADORE it when I use a cream shadow underneath as the colours really pop. I've been loving using the Covergirl Flamed Out Shadow Pencil* as a base underneath as I can just apply it straight to my eyelid without using my fingers or a brush. Another Maybelline product that I've been reaching for is the Maybelline Color Elixir By Color Sensational lip lacquers. These are perfect for days when I want colour but can't be bothered to deal with the upkeep of a lipstick. I have 3 colours, but want to pick up some more. I was on the fence about keeping my Prestige Cosmetics Sun Baked Mineral Bronzing Powder in Pure Shimmer but after using it, I've fallen back in love with it and it will stay in my stash for a while longer. I was also thinking of throwing out the Laura Mercier Limited Edition Eye And Cheek Palette. This is from about 4 years ago (possibly a Christmas palette) and I only use 3 out of the 8 colours so I wasn't too sure if it's worth keeping, but after using it I'm holding on to it for a little bit longer. 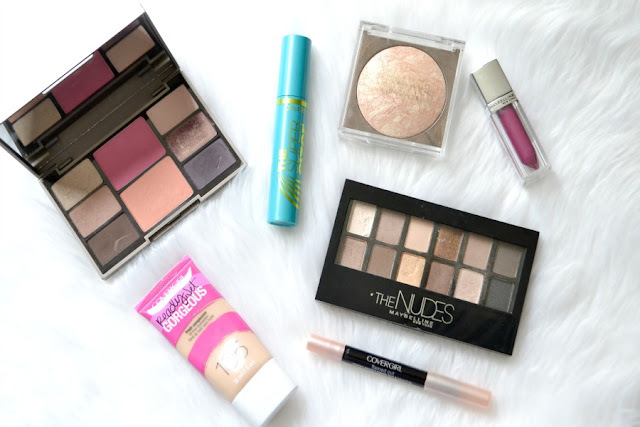 I found some really fantastic products at the end of 2015. Two amazing cleansers that I've been using are the Palmer's Ultra Gentle Facial Cleansing Oil and the Trilogy Make Up Be Gone Cleansing Balm. * I use the Palmer's oil most days as it's quick and easy to rinse off. But I like to use the Trilogy balm on days when I've got heavier make up on (usually when I've got a dark smokey eye or have full coverage foundation). I like that the balm comes with a cleansing cloth. For some reason I've struggled to find the Trilogy balm instore, but it's available from their online store. I'd recommend picking either of these up at the next Priceline 40% off skincare sale. When I first used the Grown Alchemist Polishing Facial Exfoliant: Pink Grapefruit and Glucomannan Extract I have to admit I felt a little let down. It doesn't really have a smell (I was hoping that it smelt like pink grapefruit) and it's a very gentle exfoliant. But after using it every second or third day, I've fallen in love with it. It's pricey (like all of Grown's products) but I would happily pick it when it's on sale. A while back I had a hour long facial at the Jurlique store in Burnside, which was heavenly!! It was the perfect mix of relaxation and education. We talked about my skincare routine and what concerns I had along with being left to enjoy the massage and facial in silence. I was given some of their "Purely White Skin Brightening" products and have fallen in love with their Purely White Skin Brightening Day Cream* and Purely White Skin Brightening Night Cream. * I've already finished the day cream (sad face) and have about a third left of the night cream. I really loved them and would happily buy them. Hopefully Jurlique has a GWP coming up soon! I was also given the Purely White Skin Brightening Cleanser* but found that made my skin feel a bit dry after using it. I ended up going to my local chemist which stocks Jurlique and picked up their Rose Moisture Plus Daily Moisturising Cleanser and while it didn't make my skin feel as dry, it still wasn't as moisturising as I would have liked (although the rose scent was heavenly!). I'm not sure what's going on with my skin as it's not normally dry, but I'm looking at getting one of the Jurlique face oils to help combat the dryness. I was sent the A'kin Lavender Body Wash previously and loved it so much that I picked up another bottle. I use this mostly at night, as I find it relaxing but I've been known to reach for this in the morning when it's not even 8am and I'm frazzled and stressed out. It's a bit pricey for a body wash ($22.95) but I know that it's worth it! I also like to use the matching lavender body moisturiser at night. Since you can't buy LaVanila in stores, I picked up the MooGoo Fresh Cream Deodorant to use daily. This is a fantastic natural deodorant that helps a lot in summer. I don't find that it performs any different than a chemical deodorant. I've been using the Kelapa Organics Hand And Body Lotion* as my daily morning body lotion. I like that it's really light on my skin and that it sinks into my skin quickly, which is great for those busy mornings. I'm hoping that they're going to release a thicker body lotion in the future. I've been trying to be better at using a hand cream, as my hands go through a lot of damage from washing and cleaning everyday. I've been using the Nuxe Rêve de Miel Hand and Nail Cream daily to try and keep my hands soft and smooth. I keep mine above my kitchen sink to remind myself to use it daily. 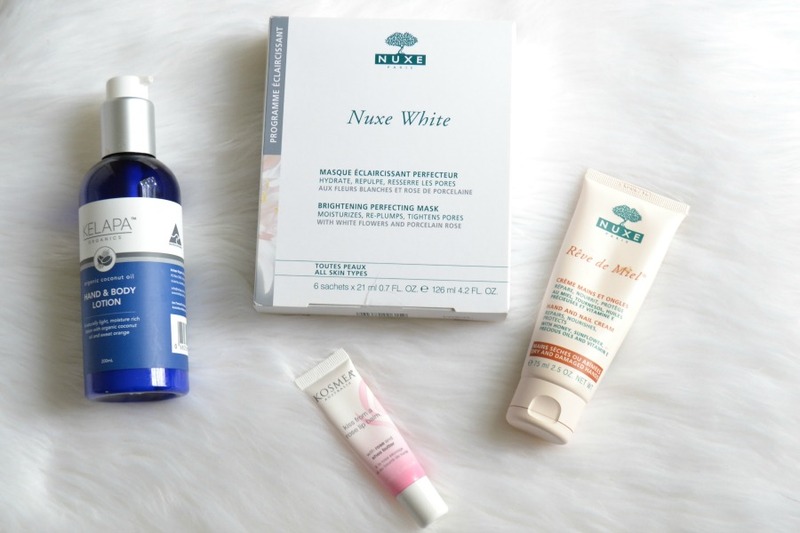 Another Nuxe product that I'm loving is the Nuxe White Brightening Perfecting Mask. * It's a cotton sheet mask that feels so cooling on my skin. I put it on for 20 minutes then rub in any of the serum that's left on my skin. I always feel like my skin looks more nourished and plumper when I use this. I couldn't see this on Adore Beauty or the Priceline website, but if you find it instore, pick it up!! It's my weekly relaxation mask. I've been loving rose scented products at the moment and I adore the Kosmea Kiss From A Rose Lip Balm. Besides smelling incredible, it really hydrates my lips. This is a must have!! I go through dry shampoo a LOT and have tried many different ones over the year. I've really loved the Kardashian Beauty Take 2 Dry Shampoo. It has a gorgeous scent to it, which will either make you love or hate the product. What I really love about this is the fact that it's light. I can use this for a few days and I don't feel like my hair feels "heavy" like it can with other dry shampoos. The only negative about this is the fact that it's so pricey (it's nearly $30) so I'll be stocking up on this at the next Priceline haircare sale. I've mentioned my love for the Wella Luxe Oil range many times before and this year they released the Wella SP Luxe Oil Keratin Conditioning Cream. * It has the same amazing smell and is one of the only conditioners that I can use without my hair feeling like it needs more moisture. I love using this when I'm in a hurry and don't have time to apply a mask. I picked up the Agadir Argan Oil Moisture Masque at the last Priceline hair sale and I fell in love with it after the first use. It's a keratin protein mask that helps to strengthen my damaged hair but it also hydrates my hair and leaves it feeling so soft. It's really thick, so you only need a very small amount as it goes really far once you rub it into your hair. It's $39.99 for a tub, so it's another product that I'll be picking up at the haircare sale. And finally I fell in love with the Paul Mitchell Marula Oil Rare Oil Treatment. * They've released a full strength and light version. I was sent both and use the light version daily and use the full strength as a treatment oil before I wash my hair. It's highly concentrated so when they say you only need 2-3 drops, they mean it! My hair is quite long and I use about 2-3 drops and rub it in and then if I feel like I need to, I'll add another drop or two. If I apply anymore, it will weigh down my fine hair. It has a really beautiful scent. While the Wella Luxe Oil is a girly scent (that smells like candy) this is a more grown up floral scent. I would suggest buying the fine version first as it's a lot thicker and heavier than my other hair oils. While it's pricey, it's completely worth the money since you use so little of it. And that's what I've been reaching for in November and December! 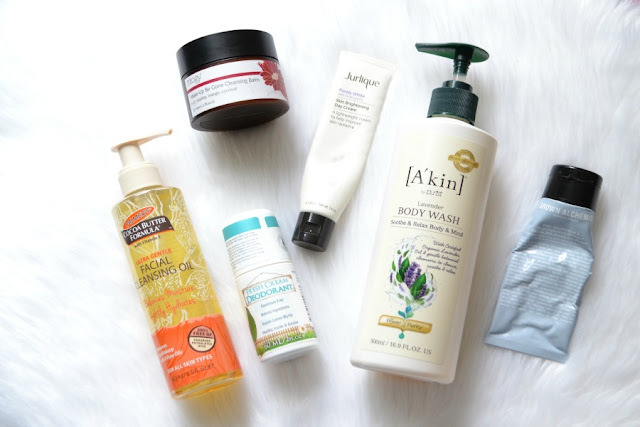 Is there any products that you couldn't live without last month? I'm not a huge Kardashian fan, but I do like the sound of that dry shampoo! It's really good!! 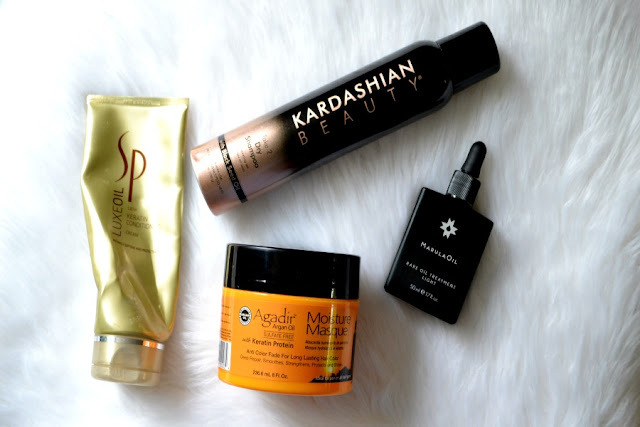 They have some more products that are coming out and I'm a bit too excited about the hair mask! Lovely favourites!! I enjoy using Jurlique products, I'm currently using their rosewater mist, a cleanser, day cream and night mask. I find cleansing oils easier to use and probably more effective than the balm version but it could be the products I have. Both kinds are nice to use. Jurlique have so many amazing products. I adore their mists! They're so refreshing.